William Caballero has built a truly comprehensive video library of French horn lessons. Students have unlimited access to classical French horn lessons online as well as sheet music and orchestral excerpts. Learn to master the French horn from a virtuoso. This lesson library contains everything you need to improve your French horn skills. You'll receive top quality classical French horn lessons from beginner to advanced skill levels. Learn at your own pace and connect with a worldwide community of musicians. As Principal Horn of the Pittsburgh Symphony Orchestra for 20+ years, William Caballero is one of today’s most respected French horn players. He is an in-demand chamber musician and has also performed with the Philadelphia Orchestra, the Los Angeles Philharmonic and others. A graduate of the New England Conservatory, William has held teaching positions at Rice University, Duquesne University and Indiana University. 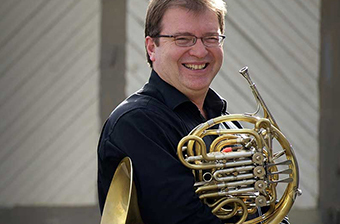 He has taught master classes at prestigious institutes around the world and currently chairs the Brass Department at Carnegie Mellon University School of Music. ArtistWorks opened the French horn lesson library in January 2013.